In celebration of International Women’s Day, we are proud to highlight the achievements of IAMAT women scholars. This year’s theme, Gender Balance, highlights the need for gender parity and how we can all play a role to advance the professional, social, and personal success of women. Historically, and still today in some countries, women have been prevented or discouraged from participating in medical fields. Although great progress has been made, supporting health practitioners who are women continues to be our goal, particularly in countries where opportunities for travel medicine training are limited. IAMAT Scholarships provide travel medicine training to doctors and nurses who need it most. Since its inception in 2002, the program has awarded over 30 scholarships to practitioners working in countries where travel medicine is an emerging specialty. So far, half of IAMAT’s scholarships have been awarded to women from Kenya, Nigeria, China, and Haiti. 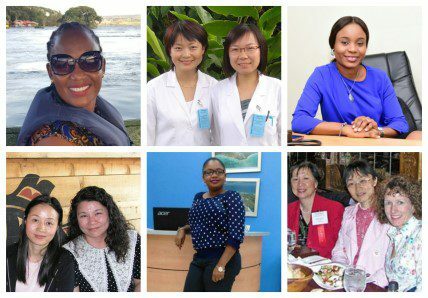 IAMAT’s women scholars are family physicians, infectious disease specialists, lecturers, mentors, and travellers who are passionate about improving healthcare in their communities. Through their training, which involves taking intensive travel medicine courses and clinical observations, practitioners gain the skills to provide better care for their patients and expand their professional experience. Past recipients have introduced travel medicine in their practice, become directors of their clinics, founded travel medicine organizations, and improved healthcare standards in their workplace. Upon her return from training with expert travel medicine faculty in Seattle, USA, Dr. Liu Chunfang introduced travel health standards and procedures in her clinic in Shenzhen, China. During their training, practitioners gain skills to provide complex pre-travel consultations and how to attend to the medical needs of travellers. Dr. Lei Da of Jiangmen, China, learned how to give tailored advice to patients. Our scholar from Cap-Haïtien, Haiti, Dr. Weedgina St Vil, is a university professor who teaches travel health to her students and colleagues. She believes that integrating travel medicine in the curriculum will contribute to better health promotion in her country. By training in a cross-cultural environment, doctors and nurses are better prepared to meet the needs of local and international patients. This approach promotes better communication and understanding of a patient’s background and experience, and leads to better relationships between the practitioner and patient. Many of our women scholars are now travel medicine advocates and leaders in their country. In Kenya, where travel medicine is an emerging practice, Dr. Marybeth Maritim has set up her own travel medicine clinic. Similarly, our most recent scholar, Dr. Yetude Fadipe of Lagos, Nigeria, is president of the newly formed ‘Society of Travel Medicine Practitioners in Nigeria’. Want to support the next IAMAT Scholar? Learn how by clicking here. IAMAT Scholars and friends, clockwise: Marybeth Maritim; Ye Wei and Meng Jing (photo by Johnnie Yates); Yetunde Fadipe; Weedgina St Vil; Elaine Jong, Lei Da, and Sheila Mackell; Liu Chunfang and Sun Huichin.